Some artefacts, such as pottery and coins, are closely datable and can therefore help to date the deposits on a particular site and build up a chronological sequence of events. Other artefacts give an indication of social status, for example the types of pottery that people could afford, the jewellery and personal adornments they wore, the food that they ate and the materials used to build their houses. By combining the results of the separate analyses, it is possible to build up a picture of the people who lived and worked along King Street in the Roman period. S1. The rough textured nature of the clay in this Orange Ware beaker; 80-120AD shows that it was made locally. His family lived in Middlewich and were in the building trade, Charles is better known for his role as Clerk to the Middlewich Urban District and for his written work. C F Lawrence had produced many historical booklets for the town to raise money for the church, extracts of which were printed in many local periodicals. He is also known for poetry but behind his writing is undoubtedly his love of Middlewich Social History. Archaeology is really a very new profession when Charles was collecting and writing about the town, at the turn of the century and through both World Wars the profession was really emerging. Up to then it had been men of learning, the gentleman antiquarian who pursued historical knowledge. Grosvenor Museum was and still is the largest Museum we have in Cheshire opening its doors in 1885, archaeological deposits from Middlewich were given to the ‘new’ museum although many ‘finds’ remained in private family collections. Although it’s clear that Charles loved social history he was also keen on archaeology and like many others interpreting what they found, built a picture of Middlewich as they saw it at that time. For example from the 18th Century many gentleman of the town were convinced of the existence of a Roman Fort at Harbutt’s Field, however they were not proved right until 1993 when a geophysical survey provided the first conclusive evidence. We are pleased to have some of the objects he collected here on show. S2. Stone Celt 1912.279 Polished stone axe found in Lawrence Gardens Middlewich, donated to the Grosvenor Museum in 1912 by C F Lawrence. S2. Stone Net Sinkers found in Croxton Gardens, Middlewich. Donated to Grosvenor Museum by C. F. Lawrence. S3. Examples of early weights presumed for nets. Knobbed Terret Ring found by K Guest in 1997. 2nd Century. Terret Rings are used as part of a horse harness guiding the reins through. Part of a Terret ring found by H Lehepuu in 1997. Gold Coin 50 BC – 50 AD this is a gold coin known as a stater, one of the earliest coins to be made in England. It was produced by the Corieltauvi tribe of Celtic people who lived in the east of England. This coin was found at Warmingham which gives us some idea of how they were traded. The local Cornovii Celts here are not thought to have struck their own coins. The pottery assemblage indicates activity from the late first/early second to the mid-second century with rather less activity after cAD160. Changes in the ceramics coming to the site over time suggest a decline in locally made ceramics in the early second century and a rise in traded coarse wares from Dorset and from kilns on the Cheshire Plain at Wilderspool and other unlocated kilns. The level of decorated samian indicated the settlement had a military-type assemblage. The evidence of the sherds conditions and secondary usage of vessels such as amphorae from the Buckley’s Field site contrasted with that at the Fairclough Site, where vessels such as amphorae and flagons had been utilised in industrial activities relating to salt production. 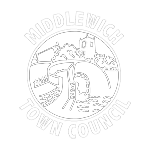 The evidence adds to our understanding of how the settlement at Middlewich may have been zoned according to the activities being carried out. 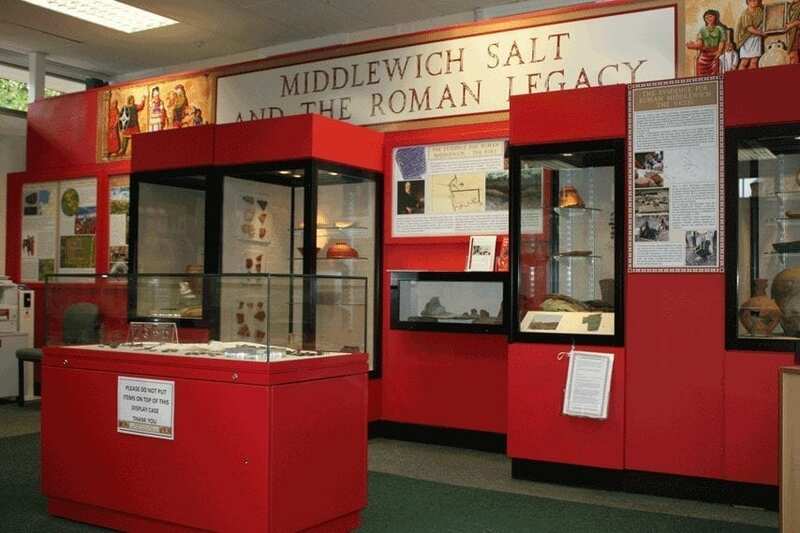 The evidence of the samian ware suggests that occupation in this part of Middlewich began in the later first century and continued at a high level well into the Antonine period. The extreme shortage of late second-century samian on this site is highly significant. All the evidence of the samian ware points to reduction in occupation before c 160. The presence of six EG vessels, and one specifically dated within the earlier third century in particular, may be taken to reflect activity in the area in the third century. Decorated fragment of a grey ware bowl, this piece is very finely made. Piece of decorative pot. The beaker has a double bead rim with a lattice decoration on the outside of the body and a decoration of applied clay in the form of a hammer. Highly decorated fragments of a cream ware bowl. Orange-ware Pottery with an impression of a face looking out. Two sherds similar to the first design above may have also been the work of Priscus and Clemens AD160-200. Shows a figure wielding a weapon. East Gaulish moulded form, decoration of a large rosette in a plain medallion used at Rheinzabern by several potters from Lanus ii onwards, possibly 200-240AD. South Gaulish Cup, Stamp perhaps reads IVLAI with a retrograde L. Likely to represent a so called ‘illiterate’ potter. Around 80-110. S10. Mortarium stamped with the makers mark on the rim, this piece is from North Warwickshire between 120 – 150AD. Two other fragments of mortarium showing the coarse white ware fabric, typical of those produced in St Albans during the late 1st Century. S11. Samian Ware Dish c. 120AD: Samian was the fine tableware of the Romans. It was made in Gaul (France) in a huge variety of forms. The smooth polished finish of Samian Ware is largely due to a coat of red slip applied before firing the clay. S11. Highly decorated samian ware bowl, found during the community dig. Intricate decoration of figures birds and leaves. S12. Grey ware bowl. This near complete bowl was excavated in Middlewich. It is a very simple bowl used for cooking and serving food. It’s style and the material it is made from suggests that it was made by a local potter. 3rd century fine cream ware flagon, which was probably made locally as tableware to hold wine. This Black Burnished Ware tankard, 120 – 200AD was made in Dorset, the Thames Estuary or Kent. It has been polished with small stones to give it a grey-black metallic sheen. Complete Samian ware bowl – highly decorated and status piece, decorated with what appears to be Gladiators and motifs. Briquetage – many forms being found which points to major salt production / kilns in the area. These pieces are clearly moulded, perhaps as part of a support bar or kiln lining. Other smaller pieces have impressions of wattle & daub and hand marks. Used between 80AD until just after 350AD. Inclusions in the clay are common as the organic fibres are burnt away in the firing. Example of a brick support similar to that documented by Benjamin Vawdrey who found his examples at Tetton in the mid 1800’s. Piece of a lead roman salt pan (used to evaporate water from the brine) with a piece of a briquetage support bar, found near King Street, Middlewich, evidence of early salt-working in the town. Piece of Rock Salt to show what the deposits are like underneath our feet and salt in the pan is made traditionally in a modern pan. These are larger grain, so more the size of fishery salt used for food preservation. We can learn about the occupations of people living at the site from the industrial materials left behind. Such materials include kiln waste from the salt making process (briquetage), metal casting waste and mis-fired pottery. The glass assemblage was dominated by thick-walled storage vessels with blue/green colouration and thin walled vessels in either blue/green, yellow or colourless glass. Of the latter, most were undiagnostic body sherds. Although not closely datable, the majority of the glass can be ascribed to the date range 120-200AD. The lack of polychrome glass popular in the first century can be taken as an indicator that there was limited activity prior to the early second century, while the colours present, including blue/green, yellow and colourless, most likely denote a date range in the 2nd – 3rd century. S18. Piece of a Roman Roof Tile, (tegula), with animal prints of possibly a kitten. Pieces of glass vessels, although small in size show the style and variation in glassware used by the settlers. Some are very finely blown items showing the quality of the pieces. Also quantities of window glass quite thickly rolled; evidence of building status. Examples of Glasswork – window glass. Much of the window glass discovered in Middlewich was cast in sheets on flat pans, giving a smooth upper surface and an opaque underside. Iron works, large amounts of iron recovered from the Buckley field site J. Mostly unidentifiable, with the exception of a few pieces such as nails and bolts used in agriculture, perhaps as a cart bolt. Selection shown are iron nails 2nd century AD, made in the town and used in the building of houses and workshops. Part of the upper half of a set of rotary quern stones c 150AD. A household tool used for grinding grain by hand. The central hole and notch were used to secure a wooden handle. It is made of lava brought from the Rhineland. Iron Shears, evidence of textiles but also dates to the 3rd – 4th century, found off King Street 1964-1969. Made in Middlewich and used for shearing wool from sheep or for trimming leather. Part of a folding camp stool found in a second century rubbish pit, off King Street. Found 1964-1969. Citizenship for themselves, their children and descendants, and the right of legal marriage with the wives they had when the citizenship was granted to them or if any were unmarried, with those who they later marry, so long as it is only one each. Given this day (three or four days before…) in the consulships of Caius Julius Bassus and Gnaeus Afranius Dexter (AD 105, 4 May – 13 July). 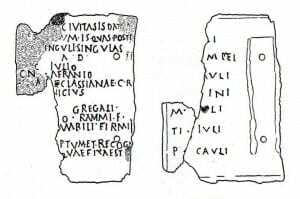 From …ala Classiana, Roman Citizens, commander…nicius. To the cavalryman called…us, son of Rammus from…and Amabillis, daughter of Firmus, his wife. Copied and checked from the bronze tablet set up in Rome. Fragments of Roman brick, second century AD with moulding sand on base, two sets of prints, possibly a piglet or baby boar and a badger. Benjamin Llewellyn Vawdrey (1809-1892), a Middlewich Solicitor by trade recorded many archaeological finds in the area. He moved from Kinderton to Tushingham Hall, near Whitchurch, in 1866. Some of the Roman objects found by him at Middlewich are now at Tushingham. S26. Roman pot locally made 26 cms high, 18cms wide. 2nd Century AD, found between 1820 and 1866. Early 2nd Century cremation urn found near Kinderton Old Hall before 1820. Locally made perfume type vessel, long necked. 11cms high, 4.5cms wide. One handled container, complete. 18cms high 13.5 cms at widest point. 2nd Century AD, found between 1820 and 1866. Bronze brooches are among the most frequent finds from Roman sites in Britain. There are many variations in design, from bow brooches, including the trumpet brooch 2nd-4th century AD) to the penannular brooch (2nd – 4th century AD). Brooches were used to pin cloaks and dresses. Relatively little is known about what kind of people (soldiers or civilians) wore which type of brooch. The more elaborate examples were tinned to give them a silvery appearance or were decorated with enamel. Decorative glass bead, dark blue. Melon beads are typical of 1st and 2nd century AD Roman military sites, and are thought to be used as decoration on horse harnesses. Examples of Fibulae and trumpet brooches from the community dig. Heart shaped metal object possibly decorative, function unknown. 41 Lead weights and decorative counters and spindle whorls recovered at the Community dig and in the 1960’s, commonly found throughout the settlement. Lead weight circular discs for measurement of produce. Pieces of lead spread through the site at Buckley Field, some used perhaps as seals or weights, craft tools. Fragments of leather-work see where someone has cut out a shoe. Pieces found in one of the brine pits. It is clearly not possible to draw far-reaching conclusions regarding coins because of the small amount found. The appearance of a coin of Nero and three Flavian coins serve to strengthen the impression that military activity came to the Middlewich-area at an early point in the Flavian period, and that activity in general remained at a significant level from that point into the second and third centuries. Although there were two fourth-century coins in the present sample, we continue to see that coins from the mid-third century onwards remain relatively poorly represented, although it should be noted that the present excavations did produce the latest coin yet recorded from Middlewich – the issue of Magnentius (AD 351-3). Future research will no doubt find a reason for the continuing paucity of late coins, although it may suggest that the principal focal-points of activity shifted within the area in the later years. Further, the complete absence of any coins later than AD 351 still requires an explanation. Coinage existed among some of the Celtic tribes of Britain before the coming of the Romans. Coins tended to be treated like treasure and hoarded away. With the arrival of Roman government, Britons had a stable currency for the first time with which to buy and sell goods. 45 The Roman silver denarii coin hoard, buried intentionally near Harbutt’s Field. Such coins often represent Army pay or at least military transactions but the circumstances of the burial remain unknown. Sestertius larger bronze, brass or copper coins of 1st and 2nd centuries AD, used by the population on a daily basis. A bronze coin known as a dupondius, minted in Roma c.14 -12 BC during the reign of the Emperor Augustus. The coin shows the emperor along with his general, Agrippa. A bronze coin with a silver coating known as an antoninianus, from the reign of the Emperor Postumus, 259 – 268 AD. Denarius solid silver coin from the reign of Emperor Trajan 98-117 AD. Denarius – Hadrian AD 119-22 IMP CAESAR TRAIANVS HADRIANVS AVU P M TR COS III CONCORD. Coins recovered at the community dig. Both silver coins were in use during the most active period of the Roman Settlement, the 2nd Century AD. Denarius – Marcus Aurelius AD 161+ DIVVS ANTONINVS CONSECRATIO (Funeral pyre on the reverse). The text on the interpretation panels was composed by Kerry Fletcher Heritage Development Officer from research, largely based on: Roman Middlewich: Reassessing its form, function and Chronology by D Garner and M Reid published in Journal of the Chester Archaeological Society Vol 83 for 2009. Edited by the project volunteer group, designed by Irene Inman. With thanks to Peter Moore-Dutton of Tushingham Hall for his loan of objects from the Vawdrey collection and help with background information and access to family documents and portraits. 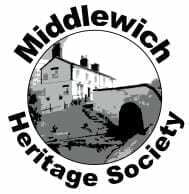 To the Middlewich Heritage Society for the loan of objects from their store. Cheshire Museum Service for their loan of items from the store. Thank you to George Twigg for his donated items regarding the salt industry and help with background information. 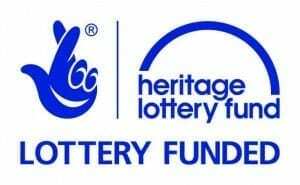 This project has been supported and largely funded by Heritage Lottery Fund, but could not have gone ahead without the help and support of volunteers from our community. 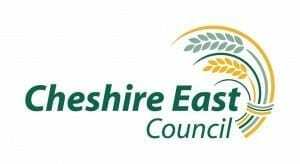 Middlewich Town Council also contributed funding to this project and further support in kind given by Middlewich Library staff and Cheshire Library Service.